The Mighty Double Down or Jucy Condo campervan is ideal for 2 couples or a Girls/Boys road trip (if you dont mind sharing double beds!) The freedom and comfort to move around, and the functional kitchen will make travelling in a group seem easy. Ideal if your planning a longer trip and are travelling on a budget. The Mighty Highball is great as backpackers tend to travel in pairs, and this 2.5 berth campervan will give them that little bit extra room. A third adult can be squeezed in, so long as they weigh less than 60 kilograms. 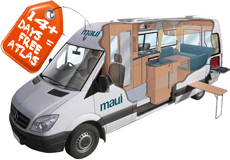 This vehicle offers excellent value for money, which is always an important factor for backpackers. If you are after a slighty larger vehicle Then look at the Mighty Deuce which is for 2 adults and has a shower and toilet. The Maui River or Maui Beach are some of the most luxurious campers and although they are slightly more expensive the extra money is worth it. You will love the extra space that this 4 berth campervan affords. with all the trimmings, from a shower and a toilet to a microwave and a DVD player. As they are under two years old they are very reliable, so your peace of mind is assured. The Pacific Horizon 4 Berth Premium is a unique vehicle which will carry a family of four - 2 adults and 2 children. It has a powerful turbo diesel engine which is a pleasure to drive. And a nifty pop top for those road side lunches and night set up that allows you to walk around and prepare meals in the compact kitchen. The front seats swivel to face the rear for night time meals and to entertain the kids it has a TV/DVD player installed. For an exceptional roomy alternative the Pacific Horizon SAM Premium would suit if your kids are older and like their own space. It also has a shower and toilet, which makes stopping in National Parks more comfortable. And a TV and DVD player if they just can't do without their technology. There is also the Britz Explorer and the Britz Frontier that may not be as new but the price may be more appealing. If you're looking at similar size to the Pacific Horizon 4 Berth Premium, then we can offer the Mighty Double Down and the Britz Voyager. Both these vehicles offer 2 double beds, Kitchen facilities and room to move about.